Advanced photostable UVA and UVB protection. 24hr hydration. Enriched with sustainably sourced shea butter. Non-greasy and absorbs quickly. Water resistant. 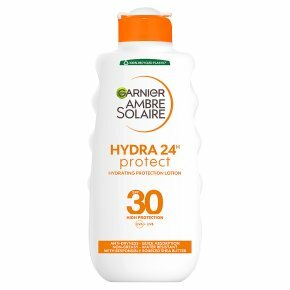 Garnier Ambre Solaire Ultra-hydrating sun lotion SPF30 provides advanced UVA and UVB protection. Ultra-hydrating formula that helps to protect against the drying effects of the sun for a soft feeling and hydrated skin. The formula is enriched with sustainably sourced Shea butter. The filtration system features Mexoryl ®SX and helps to protect against: UVB: Immediate sun-induced skin damage UVA: long-term sun-induced skin damage and premature skin-ageing. Tested under dermatological control. Formula conforms 100% to European recommendations for protection against the harmful effects of UVA and UVB rays. Garnier suncare research is recognised by the British Skin Foundation. Apply the sunscreen product just before sun exposure. Re-apply frequently and generously to maintain protection, especially after swimming, perspiring or towelling. Over-exposure to the sun is dangerous.<br>Do not stay too long in the sun, even while using a sunscreen product, because it does not provide 100% protection.<br>Keep babies and young children out of direct sunlight. Keep them well covered with a hat, T-shirt and sun glasses.<br>Avoid the eye area. In case of contact with eyes, rinse them immediately and thoroughly. Avoid contact with fabrics to prevent staining.